Fig. 9.1(b). Examples of element types with nodal points numbered. simultaneous equations to provide the displacements for every node in the model. Once the displacement field is determined, the strains and hence the stresses can be derived, using strain-displacement and stress-strain relations, respectively. The fem. emerged essentially from the aerospace industry where the demand for extensive structural analyses was, arguably, the greatest. The general nature of the theory makes it applicable to a wide variety of boundary value problems (i.e. those in which a solution is required in a region of a body subject to satisfying prescribed boundary conditions, as encountered in equilibrium, eigenvalue and propagation or transient applications). Beyond the basic linear elastic/static stress analysis, finite element analysis (fea. ), can provide solutions to non-linear material and/or geometry applications, creep, fracture mechanics, free and forced vibration. 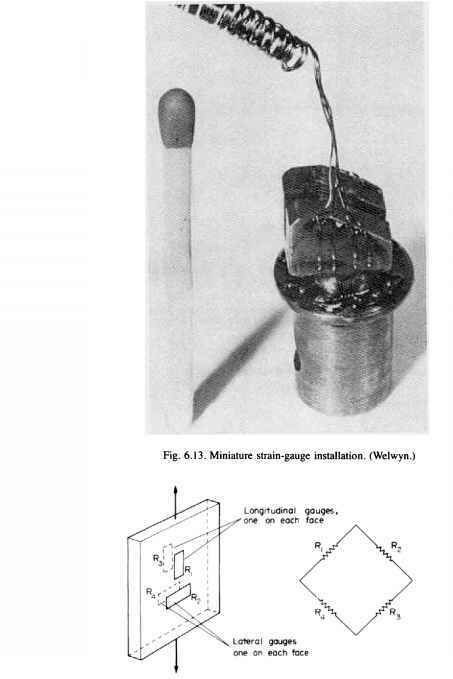 Furthermore, the method is not confined to solid mechanics, but is applied successfully to other disciplines such as heat conduction, fluid dynamics, seepage flow and electric and magnetic fields. However, attention in this text will be restricted to linearly elastic static stress applications, for which the assumption is made that the displacements are sufficiently small to allow calculations to be based on the undeformed condition. Even with restriction to solid mechanics applications, the fem. can be formulated in a variety of ways which broadly divides into 'differential equation', or 'variational' approaches. Of the differential equation approaches, the most important, most widely used and most extensively documented, is the displacement, or stiffness, based fem. Due to its simplicity, generality and good numerical properties, almost all major general purpose analysis programmes have been written using this formulation. Hence, only the displacement based fem. will be considered here, but it should be realised that many of the concepts are applicable to other formulations. In §9.7, 9.8 and 9.9 the theory using the displacement method will be developed for a rod, simple beam and triangular membrane element, respectively. Before this, it is appropriate to consider here, a brief overview of the steps required in a fe. linearly elastic static stress analysis. Whilst it can be expected that there will be detail differences between various packages, the essential procedural steps will be common. The basic steps involved in a fea. are shown in the flow diagram of Fig. 9.2. Only a simple description of these steps is given below. The reader wishing for a more in-depth treatment is urged to consult some of numerous texts on the subject, referred to in the introduction. Fig. 9.2. Basic steps in the finite element method. trained and experienced analyst and time for data preparation and processing should not be underestimated when selecting the most appropriate method. Experimental methods such as those described in Chapter 6 provide an effective alternative approach. It is desirable that an analyst has access to all methods, i.e. analytical, numerical and experimental, and to not place reliance upon a single approach. This will allow essential validation of one technique by another and provide a degree of confidence in the results. Commercially available finite element packages usually have a number of different elements available in the element library. For example, one such package, HKS ABAQUS12 has nearly 400 different element variations. Examples of some of the commonly used elements have been given in Fig. 9.1. Often the type of element to be employed will be evident from the physical application. 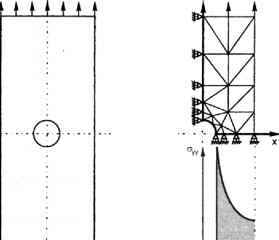 For example, rod and beam elements can represent the behaviour of frames, whilst shell elements may be most appropriate for modelling a pressure vessel. Some regions which are actually three-dimensional can be described by only one or two independent coordinates, e.g. pistons, valves and nozzles, etc. Such regions can be idealised by using axisymmetric elements. Curved boundaries are best represented by elements having mid-side (or intermediate) nodes in addition to their corner nodes. Such elements are of higher order than linear elements (which can only represent straight boundaries) and include quadratic and cubic elements. The most popular elements belong to the so-called isoparametric family of elements, where the same parameters are used to define the geometry as define the displacement variation over the element. Therefore, those isoparametric elements of quadratic order, and above, are capable of representing curved sides and surfaces. (d) the degree to which the physical structure needs to be modelled. Use of the elements with a quadratic displacement assumption are generally recommended as the best compromise between the relatively low cost but inferior performance of linear elements and the high cost but superior performance of cubic elements. This step is equivalent to replacing the actual structure or continuum having an infinite number of dof. by a system having a finite number of dof. This process, known as discretisation, calls for engineering judgement in order to model the region as closely as necessary. Having selected the element type, discretisation requires careful attention to extent of the model (i.e. 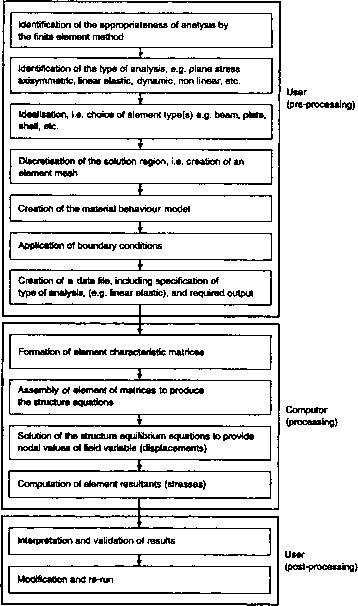 location of model boundaries), element size and grading, number of elements, and factors influencing the quality of the mesh, to achieve adequately accurate results consistent with avoiding excessive computational effort and expense. These aspects are briefly considered below. Reference has already been made above to applications which are axisymmetric, or those which can be idealised as such. Generally, advantage should be taken of geometric and loading symmetry wherever it exists, whether it be plane or axial. Appropriate boundary conditions need to be imposed to ensure the reduced portion is representative of the whole. For example, in the analysis of a semi-infinite tension plate with a central circular hole, shown in Fig. 9.3, only a quadrant need be modelled. However, in order that the quadrant is representative of the whole, respective v and u displacements must be prevented along the x and y direction symmetry axes, since there will be no such displacements in the full model/component.